The T-Molding is shaped exactly like it sounds. The purpose of this molding is for transitioning between same height surfaces and covering up uneven edges. 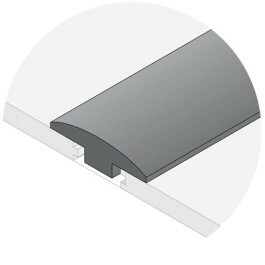 The T-Molding is a critical piece for a floating installation because it allows for movement beneath. When installing this for floating floors, it is important to ensure the molding is attached to the subfloor and not to your wood flooring.